Wednesday, May 1, 7:00 to 9:00 pm, MVR High School. Join Robert Culbert on a hunt for woodcocks and whippoorwhils. Carpool starts from the high school parking lot. $30, $15 for ages 18 and under. Thursday, May 2, 3:30 to 6:00 pm, Sassafras in Aquinnah. Saturday, May 4, 9:00 to 11:00 am, Felix Neck Wildlife Sanctuary. Train to become a volunteer to help Felix Neck monitor island horseshoe crab populations. Returning volunteers welcome. Dress for the weather. Please wear shoes that can get wet. For further information and registration, please call Felix Neck at 508 627-4850. A great way to celebrate Spring! Spend a spring morning with The Trustees of Reservations caring for the Island’s only public Japanese-style garden. Bring your own work gloves, rakes, and shovels. For more info, call 508 693-7662. Join Slow Food MV and Felix Neck for a day of celebrating nettles and other wild foods. Learn how to identify spring wild foods and how to create your own nettle patch. Featuring a talk by herbalist Holly Bellebuono, cooking demos by local chefs, a wild food potluck, and prizes for the "wild food challenge." Weather Permitting. For schedule, additional information or tickets to attend the cooking demos, visit Slow Food. Sunday, May 5, 1:00 pm, West Tisbury. Land Bank staff lead a guided walk at Blackwater Pond Reservation off Lambert's Cove Rd. in West Tisbury. The walk will last approximately 1-2 hours. Rain or shine, so dress for the weather. For more information call the land bank office at 508 627-7141. It's a big job, but you have to start somewhere. Hazel (and George, background) Hearn at Owen Park Beach. This year’s after-party was graciously hosted by the Harbor View Hotel and featured their own great food along with donated treats from Flatbread Co. and the Scottish Bakehouse. Thanks to them and our other major sponsors, M.V. Savings Bank, Comcast, and WMVY (who broadcast live from Eastville Beach). For more photos, check out the slideshow at our website. Thanks to Patti Leighton, Susan Safford, and Signe Benjamin for contributing their photos. If you have any of your own that you’d like to share, please send them along! One Beach Clean-Up volunteer deserves congratulations as well as thanks: as the winner of our Earth Day raffle, VCS member Julia Livingston of Cambridge and Edgartown will be taking home a copy of Oceans, a beautiful book/DVD/Blu-ray set by Jacques Perrin. 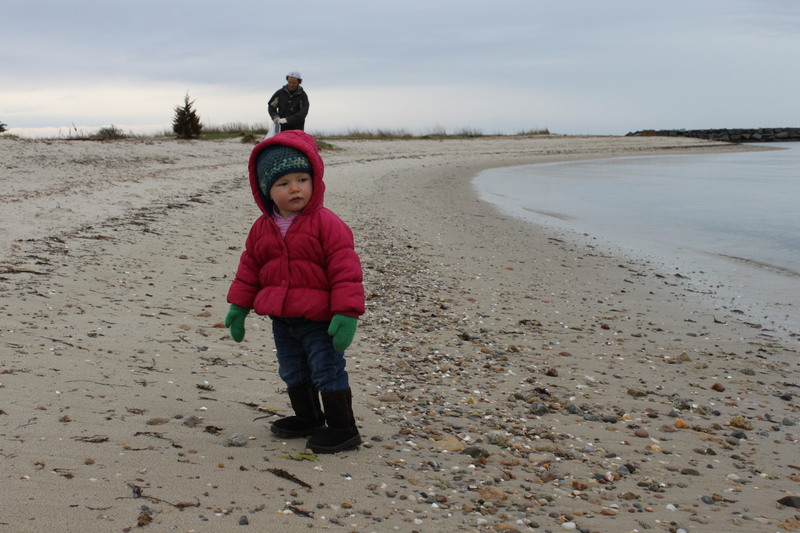 Julia helped clean up Menemsha beach. Congratulations also to Mark Kaltenbacher, the winner of a basket of environmental- and sustainability-themed books picked out by the VCS Board of Directors. The book basket raffle was part of last winter’s new membership campaign. But you don’t have to wait until next holiday season to get a little something extra for joining VCS: right now any new members can choose to receive one of our two most popular books, Walking Trails of M.V. or Edible Wild Plants of M.V.